Who Has The Best ‘REAL FRIES’ in Austin? The English douse them with malt vinegar, the Dutch dip them in mayonnaise. In Belgium, they’re eaten with buckets of steamed mussels, and in America, we usually opt for a good dunking in ketchup. Though commonly referred to as ‘French fries’ (except by the English who insist on calling them ‘chips’), they actually originated in Belgium, where they are appropriately called ‘patat friet’ (fried potato), and are considered to be the national food. Any article on ‘fries’ should include at least a bit of history on their origin, since it’s rather fascinating. So here it goes: The potato has been cultivated in the cool highlands of Peru and Bolivia for over 4000 years. Encountered by Spanish invaders in1524, the small knobby tubers were brought back to Spain and Italy in the1550’s but did not grow well in their new, warmer climes and were thought to be ‘bitter’. Classified by European botanists as a member of the Solanum Genus of deadly nightshades, the upper classes considered the potato acceptable for slaves and peasants, only. However, by the turn of the 16th Century, Sir Walter Raleigh and/or Sir Francis Drake (still a topic of debate) successfully introduced the humble potato to England, Ireland, Holland, and Belgium, where it seemed to flourish. Then the story takes an interesting turn. Sometime around 1680, the poor inhabitants of Belgium’s Meuse Valley experienced a freezing over of the river and streams where they caught small fish to supplement their meager diet. With no fish to fry, they took to cutting up potatoes in the size and shape of little fish and frying them in beef tallow. The results were a delicious fried potato that eventually spread to Holland and France, and by the turn of the 18th Century were all the rage in Paris - impressing even distinguished visitors like Thomas Jefferson. In 1802, ‘pommes frites’ made their American debut at a White House dinner hosted by President Jefferson, himself. Now skip to 1918 and the final days of WW1: American & Canadian soldiers assisting in the liberation of Belgium, arrived in a French-speaking part of the country, were served some of the tasty fried potatoes, and promptly began calling them ‘French’ fries, not ‘Belgium’ fries. When the soldiers returned home, so did the name, which rapidly caught on. A few years ago, the Bush Administration wanted to rename them ‘freedom fries’ - a similar tact was taken during WW2 when Americans were instructed to call sauerkraut ‘liberty cabbage’ and hamburgers ‘victory steak’, as a way of de-Germanizing the words. But more often these days, French fries are simply called fries. Even the Belgians have shortened the name to ‘frietjes’ (FREET-yes). Whatever the name, our country consumes over 4.5 billion pounds of them a year, and mostly of the machine-cut and frozen variety - they’re not even fresh, or what I choose to call ‘real’. Still worse, they might be battered and/or coated in a mixture of salt and sugar. This is not only the case with fast food chains, but many better restaurants as well…they’ve decided it’s too much time and trouble (meaning too expensive) to bring in whole potatoes, then hand-cut and ‘double-fry’ them, a technique which requires an initial dunking at about 275* (to cook the interior), followed by a second immersion at 375* (to crisp the exterior). The resulting fry needs little seasoning to still be addictive. Thankfully, there are some hold-outs…Austin establishments going that ‘extra mile’ to offer customers ‘real fries’, and in several different varieties - from fancy specialty fries to thick, medium, or shoestring cuts; from an extra crispy waffle-style to a moist and tender sweet potato version; and last but not least, an exotic newcomer, the Yuca fry. I’m also including details on how they’re prepared. For instance, we Americans seldom fry in peanut oil (the best option according to the French). Peanut oil can be heated to a higher temperature without burning and hence produces a crispier fry with almost no absorption. We’ve also curtailed the use of beef tallow (still preferred by the Belgians and infamously used by MacDonald’s), for national health reasons. My hope is that after reading this list, you too will go that ‘extra mile’ and choose to spend your money at one of these laudable eateries. 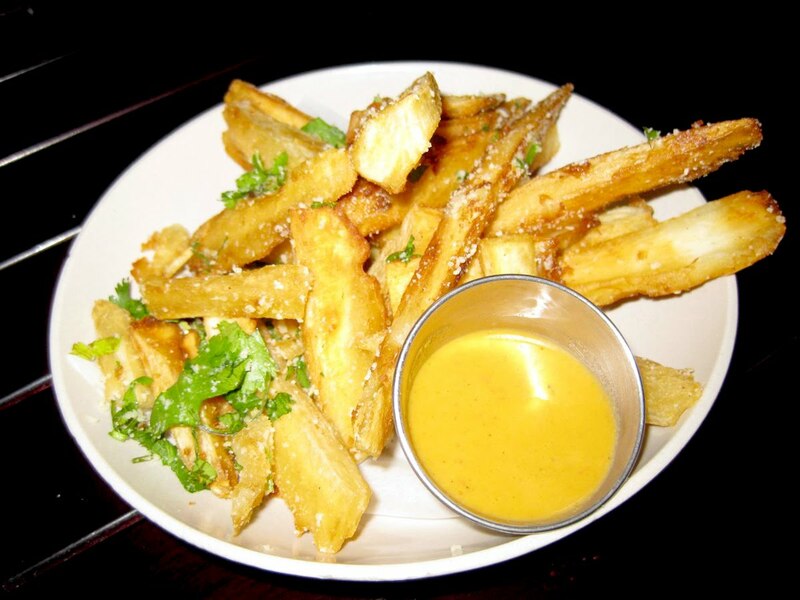 1) FANCY FRIES: Enoteca, 1610 S. Congress, 441.7672. 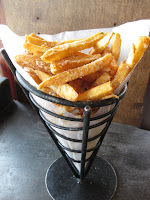 Also known for their fabulous Italian food, this chic yet unpretentious café offers two flavors of Patate Fritte, elegantly served in an upright, cone-shaped wrought iron basket lined w/ white deli paper. The fries are individually hand-cut w/half the skin left on, double-fried in soybean oil, and then sprinkled w/ grana padano cheese, garlic, and fresh parsley. They’re crisp, golden brown, and only slightly salty. They run $5 per order but will easily serve two, and come with both a lemon aioli and stellar ‘house-made’ ketchup! Well worth the price. 2) THICK-CUT: El Sol Y La Luna, 600 E. 6th St, 444.7770. Also called ‘Steak Fries’ (but listed on the menu as ‘home fries’), El Sol cuts each potato into thick, irregular shapes, then deep fries them in canola oil ‘til they’re crisp & golden on the outside, moist on the inside, and somehow never greasy. Served with their delicious Pork Sandwich, you can also order them as a side, or better still ‘Mexican style’, topped with a tomato/onion/cilantro ‘pico de gallo’ & melted cheese ‘queso’. Two can share a $5 portion. 3) MEDIUM-CUT: The Woodland, 1716 Congress Ave, 441.6800. Sometimes simplicity is the best approach, though it took owner/chef, Michael Terrazas a bit of time to perfect this sublimely simple fry with just a hint of salt. The potatoes are peeled fresh each morning, hand-cut, then popped in the freezer to reduce the temperature and starch level. Each batch is then double-fried in canola oil to a deep golden brown and served with a choice of condiment – ask for the ‘cayenne cream’, which also accompanies their popular corn fritters. Small order $4/ Large $6. Also: Dirty Martin’s, 2808 Guadalupe, 477.3173. This diner (the 1st Drive-Thru in America!) has been making fresh, hand-cut fries for over 80 years! Double-fried in canola oil with the peel left on, a full basket of tasty golden fries w/ some house-made salsa costs a whopping $2. You can also opt for a larger order of Chili/Cheese Fries ($5.50) that are smothered in a yummy combo of house-made chili & melted American cheese. 4) THIN-CUT: P.Terry’s, N. Lamar, 371.9975; S. Lamar, 473.2217; Wm. Cannon, 358.0380. 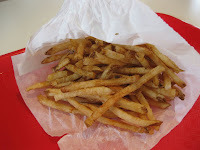 Thanks to my husband, I recently became a fan of these scrumptious little skin-on fries (also known as shoestrings). Hand-cut and cooked in their own exclusive fryer, they can be ordered with or without salt (the only place in town promoting this idea), and come in a triangular-shaped, eco-friendly white paper bag. At a mere $1.45, these tender morsels are a screaming deal. 5) WAFFLE-CUT: The Jackalope, 404 E. 6th St, 472.3663. I searched all over town to find these 70’s-era oddities and was finally rewarded at one of Austin’s best dive-bars (which also has one of my favorite burgers – The Blackened Caesar). These disc-shaped, crosshatched babies are full of holes which means more frying surfaces and an extra crispy result. For the sake of disclosure, they are frozen, but I couldn’t find a fresh version anywhere else (don’t even mention those pathetic things at M.F.). Cooked in canola oil to a deep golden brown, then lightly dusted w/ Lawry’s Seasoning Salt ($1.50 for a side/$4.50 for a huge Basket O’ Fries). 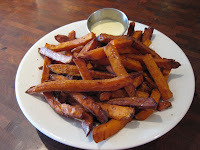 6) SWEET POTATO FRIES: Counter Café, 626 N. Lamar, 708.8800. The most challenging fry of all, due to the moisture content. Every other place I checked (The Galaxy, Kerbey Lane, Phil’s Icehouse, Opal Divine’s, Central Market) were all bringin’ in the ‘frozen’ ones. So how do they do it at The Counter Café? The potatoes are hand-cut with the skin on, triple-fried in soybean oil, then very lightly salted. They’re still only slightly crisp but burst with the flavor of fresh, creamy sweet potato. Served with a perfect lemon aioli. Kudos for giving us the real deal! A side for 2 runs $5. 7) YUCA FRIES: Rio’s Brazilian Café, 408 Pleasant Valley Rd, 828.6617. The yucca root seems to take to hot oil like a duck to water, and Rio’s chef, Elias Martin knows just how to finesse it. The large tuber is peeled and boiled for 20-30 minutes, then hand-cut and fried once in 400* canola oil. The light and crispy fries are then dusted with a little salt & pepper, sprinkled w/ parmesan cheese, and garnished w/ fresh scallions. Served with a spicy ‘malagueta’ sauce, a $4 portion satisfies 2-3 blissful eaters. 8) STILL GOOD IN SPITE OF BEING FROZEN. I know this article has made a case for fries being ‘fresh & hand-cut’, but since I ended up listing a ‘frozen’ version in the Waffle-Cut category, I thought it only fair to mention a couple of other restaurants that are managing to put a respectable spin on the frigid little buggers. Opal Divine’s, 700 W. 6th St; 3601 S. Congress. A medium-cut frozen fry that gets rolled in cracked pepper and single-fried in soybean oil until it’s super crisp and golden brown. The pepper provides more crackle than heat and it comes with a delicious, house-made, Dill Ranch Dressing ($4.25). NXNW Restaurant & Brewery, 10100 Capital of Texas Hwy. If you want something to go with that pint of Duckabish Amber Ale, a huge bowl of peel on, medium-cut fries cooked in soybean oil, tossed w/ sautéed garlic & olive oil, sprinkled w/ salt, and covered in parmesan cheese should do the trick. They’re soft, not crispy, and a light golden brown. A side serves 3-4 people for $3.95. TONIGHT - 5/8/10 - Road To The Bash!